They couldn't understand the words, but they totally understood the meaning. Discovering the mysteries of fado in Lisbon. A reader story. LISBON, Portugal – We had spoken to Ricardo, the concierge at our hotel, , about the fado music he played, and he wrote down the name of the restaurant where he had a gig on Thursday, our last night in Lisbon. He played there every week, but he warned us that there was a chance he wouldn't make it this time because his wife was nine months pregnant. Still, with no cell phones or way to him, we took a cab to the restaurant as soon as we got off the bus after a quick trip to Lagos. As our cab pulled up to the restaurant, I heard my friend Randi speaking to someone out the window. I stepped out and saw a woman with a full pregnant belly. She ran up, kissed us on both cheeks, and said, "Ricardo, these are the girls you told me about? I'm so glad you came!" Ricardo and Elena led us into the restaurant. Elena sat with us as Ricardo set up his guitar with the other musicians. It was a small restaurant, with maybe ten tables. Everyone knew everyone else well and looked at us quizzically, wondering why these foreign strangers had come to join their weekly fado. Elena introduced us to our waitress, Matilda, and suggested we order cod. I was so sick of cod by this point in the trip, but I wanted to take her up on her recommendation, so I agreed. Elena told us about her upbringing in a small town outside Naples, about how she met Ricardo while working in Ireland. He won her over by playing an acoustic version of "Hit Me Baby One More Time" on his guitar one night in their hostel. Elena was engaged to someone else back in Italy, but after meeting Ricardo, she decided to marry him instead. They had a traditional wedding near Elena's family in Italy, but now lived in Lisbon, close to Ricardo's family. Before the music started, Elena prepared us for exactly what was about to happen, which we were grateful for. 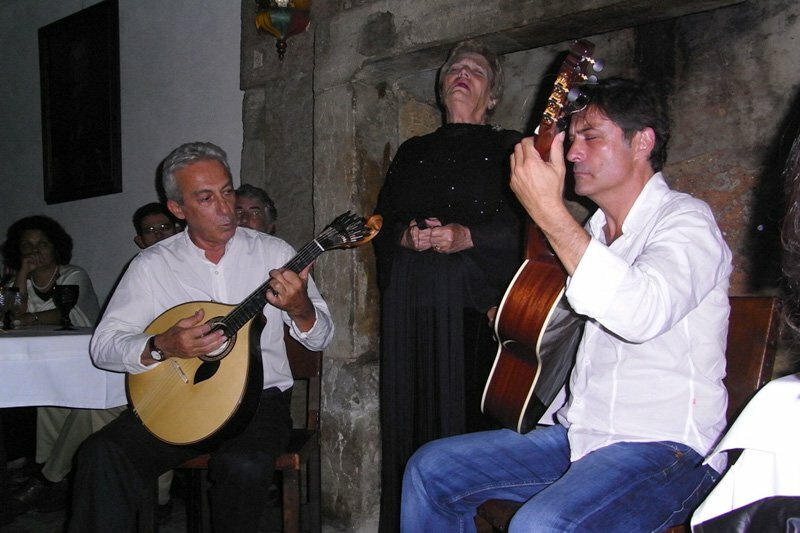 The tradition of playing fado music is very different from anything I've seen in America. The closest music I can compare it to is opera. After our meal was served, the lights were dimmed, everyone grew silent, and four men softly began playing their fado guitars — beautiful, round-bodied string instruments. A man from the audience stood up and began singing a slow, emotional tune. I was fascinated, but Elena whispered that he was one of the worst in the group. Other singers in the audience took their turns, performing about three songs each. Then, to our surprise, Matilda took her turn. Our petite waitress began singing an emotional, moving piece, and Randi and I finally understood what made fado such an incredible art form. She put her soul into the performance, doing the entire thing with her eyes closed, bringing the restaurant to tears. Elena told me that Matilda had recently lost her husband to cancer and this was her way of expressing her grief. I couldn't understand the words, but I could feel how much Matilda ached. We finished our meal and said goodbye to the group. Ricardo and Elena drove us back to the hotel. We hugged them and thanked them profusely for giving us this amazing, unique, and authentic Portugese experience on our last night in Lisbon. Two weeks later, we got an email that baby Francesco hed been born weighing 3.3 kilos. The family couldn't have been happier. This story was originally published on Amy's blog, , and is reprinted here with permission. Amy is a PR professional and philanthropist in New York City. She travels for the culture, inspiration, and experience.